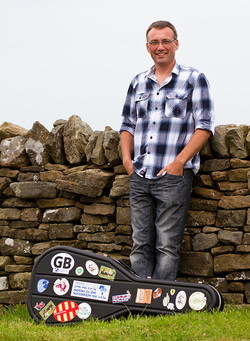 Simon Haworth is a guitarist, singer and songwriter from Northumberland. Simon Haworth has two CD's released on the Fellside label, recorded and toured the world with Jez Lowe & the Bad Pennies and played at the premiere of the Lord of the Rings film. He even had one of his tunes played on Songs of Praise! Simon's songwriting is now starting to attract more attention since the release of his Taking Routes album. His song Turn to the Sea won the song-writing competition at The Songs of the Sea Festival in Maryport, West Cumbria. Another song by Simon, The North Eastern Line is featured on the A Full Head of Steam album and Rory's Still has been recorded by Scottish folk singer Robin Laing on his album One for the Road. He currently plays with top Northumberland ceilidh band Real to Reel. Simon played bass with Jez Lowe & the Bad Pennies from July 1998 until March 2004 touring in Holland, Belgium, Denmark, Australia, USA and Canada as well as extensively across the UK. He also toured as accompanist with top fiddle and Northumbrian Pipes duo, Tom McConville & Pauline Cato before forming a 4 year musical relationship with champion Northumbrian Piper Andy May seeing them record two albums together with Fellside Records.